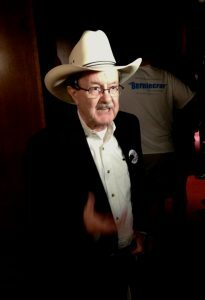 Jim Hightower in LaCrosse, Wisconsin for a 2016 campaign event. It was, of course, a retort to Donald Trump’s ignorant campaign to demonize the news media as “the enemy of the people.” But when it comes to America’s once-proud newspapers, their worst enemy is not Trump—nor is it the rising cost of newsprint or the “free” digital news on websites. Rather, the demise of the real news reporting by our city and regional papers is a product of their profiteering owners. Not the families and companies that built and nurtured true journalism, but the new breed of fast-buck hucksters who’ve scooped up hundreds of America’s newspapers from the bargain bins of media sell-offs. The buyers are hedge-fund scavengers with names like Digital First and GateHouse. They know nothing about journalism and care less, for they’re ruthless Wall Street profiteers out to grab big bucks fast by slashing the journalistic and production staffs of each paper, voiding all employee benefits (from pensions to free coffee in the breakroom), shriveling the paper’s size and news content, selling the presses and other assets, tripling the price of their inferior product—then declaring bankruptcy, shutting down the paper, and auctioning off the bones before moving on to plunder another town’s paper. By 2014, America’s two largest media chains were not venerable publishers who believe that a newspaper’s mission includes a commitment to truth and a civic responsibility, but GateHouse and Digital First, whose managers believe that good journalism is measured by the personal profit they can squeeze from it. As revealed last year in an American Prospect article, GateHouse executives had demanded that its papers cut $27 million from their operating expenses. Thousands of newspaper employees suffered that $27 million cut in large part because one employee—the hedge fund’s CEO—had extracted $54 million in personal pay from the conglomerate, including an $11 million bonus. 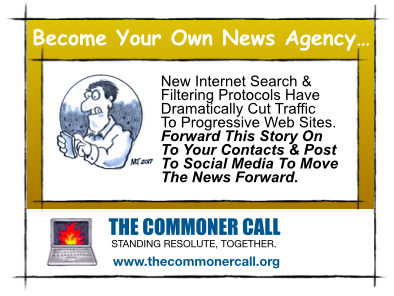 But achieving it requires a basic level of community-wide communication—a reliable resource that digs out and shares truths so people know enough about what’s going on to be self-governing. This is the role Americans have long expected their local and regional newspapers to play—papers that are not merely in our communities, but of, by and for them. Of course, being profit-seeking entities, that are usually enmeshed in the local moneyed establishment, papers have commonly (and often infamously) fallen far short of their noble democratic purpose. Overall, though, a town’s daily (or, better yet, two or more dailies) makes for a more robust civic life by devoting journalistic resources to truth-telling. As Robert Kuttner reported, these tyrannical private equity firms are paper constructs that produce nothing but profits for faraway speculators. He notes that the blandly-named entities only exist “thanks to three loopholes in the law”—the first lets them operate in the dark, the second provides an unlimited tax deduction for the massive amounts of money they borrow to buy up newspapers, and the third allows them to profit by intentionally bankrupting the paper they take over. Marc Lamont Hill, a professor at Temple University and a fierce advocate for equality, was perhaps the strongest, most articulate and most passionate voice against racism and bigotry among CNN’s regular contributors. Today, CNN fired him because he believes Palestinians, too, fit into a vision where all people deserve equal rights. For CNN, that was just too much. Marc was targeted by what can only be described as an organized campaign to silence his principled and consistent advocacy against racism and for the equal treatment of all people, including Palestinians. Wednesday, as part of a Special Meeting of the Committee on the Exercise of the Inalienable Rights of the Palestinian People, in observance of the United Nations International Day of Solidarity With the Palestinian People at U.N. headquarters in New York, Marc was invited as a member of civil society to provide a statement to the forum. He did so having just returned from the Palestinian territories, and he made clear that his experience as a black American and the history of struggle against slavery and Jim Crow in the United States inform his solidarity with the Palestinian people.